This recipe is another favorite in our house. It takes a little while to make (about 30 minutes) but is so delicious! What takes up most of the time is the prep work, but once it’s done, assembly is easy, and you can store it in the refrigerator until you’re ready to cook it! First prepare all ingredients, cut peppers, mozzarella (into slices), warm up Spinach if using frozen, shave zucchini into noodles, and grate cheese and preheat oven to 180 degrees Celsius. Once everything is prepared, start layering, the layering remains the same throughout the recipe -tomato sauce, noodles, zucchini, peppers, cheese, repeat. First, start with a layer of tomato sauce in the bottom of your dish. Add a layer of noodles on top -if you are doing low carb, only put one noodle per layer to absorb some of the liquid from the vegetables. Add a layer of shaved zucchini. 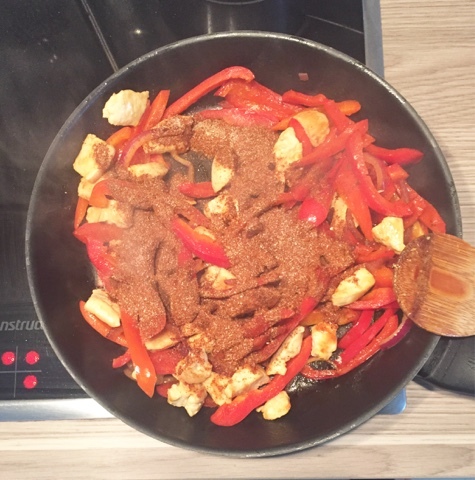 Add a layer of peppers. Add a layer of grated cheese, and top it off with some tomato sauce. Repeat this one more time. After making 2 full layers (stop with the tomato sauce layer) add a noodle layer and mix your spinach and ricotta together. Spread this mixture over the noodle layer and add another noodle layer on top of it. Then continue as normal. Layer of zucchini, peppers, cheese, tomato sauce and one more layer of noodles. Then for the top I will add any tomato sauce I have left over, the remaining grated cheese and the mozzarella. Put it in the oven for 40 minutes and enjoy! First off, I want to add that I am, in no way, trying to earn an award for healthiest recipe with this one. In fact, it is probably the least healthy recipe I have made, however, it is delicious as a treat once a year. This is a Hungarian dish that is served in Germany at the Christmas markets, usually I love the Christmas markets (I’m sure you do too if you’ve been lucky enough to celebrate Christmas in Germany). However, this season, I wasn’t feeling it. The long lineups, masses of people and worst of all for a pregnant woman, the lineup for the washroom was not screaming my name! So we decided to opt out of the Christmas markets this year, resulting in me craving a Langos and having to resort to making one myself. So if you’re up for some deep fried bread covered in cream and cheese, this is your recipe! many people also put garlic paste on theirs, I have yet to find one I like. Really, as far as toppings go, your options are endless. So first, add the yeast to the flour (mix well) and the salt to the warm water (stir until dissolved). 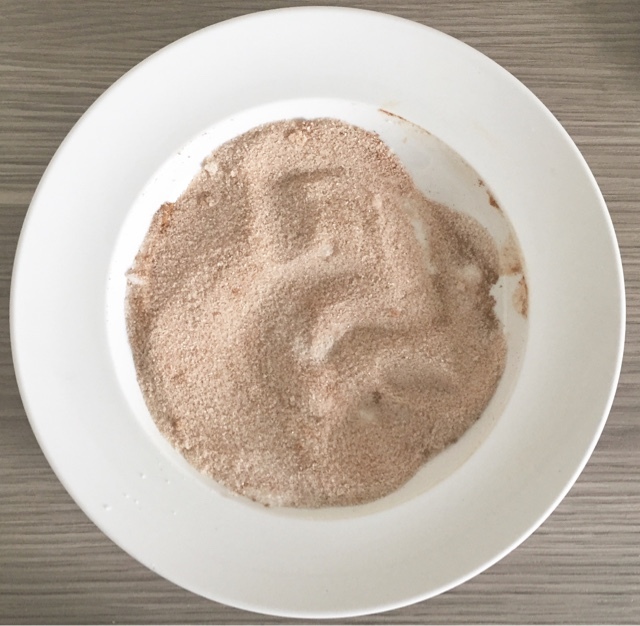 Add the salt water to the flour and, using either your hands or a spoon, mix well until the dough forms a ball. It should still be fairly sticky, but not stick to the edges of the bowl. Flour your working space and roll the dough around so it doesn’t stick too much. roll the dough into a log and cut into 8 pieces (more or less depending on how big you want them, but remember they have to fit into your pan to fry them). This process is the same for each ball of dough: form it into a ball and pulling from the middle outwards form a circle. 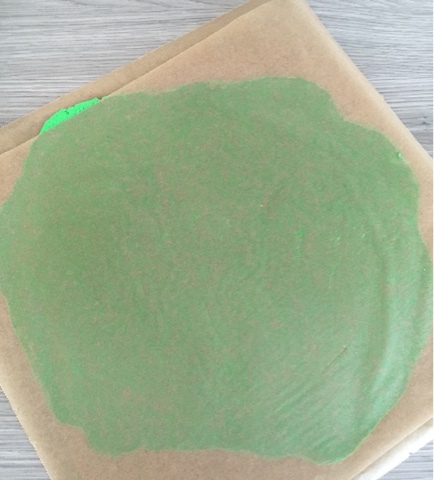 Once the shape is starting to form, lay it flat on the floured surface and pull on the sides making the middle thinner than the outer layer. Ideally they should be thin enough to see through them in the middle with thick edges. Once all the balls are shaped, let them rise again for 30 minutes. While waiting on them to rise, heat up your oil. Depending on the size of your pan, you will need about an inch deep of oil to cook the dough. Set stove to medium heat and allow it to heat up, around 15-20 minutes. I usually grab a small piece of dough and put it in to see when it starts sizzling, then I know it is warm enough to cook the dough. Place the dough in the pan and allow it to cook for 10 minutes (or until desired colour). flip it over and cook for another 5-10 minutes, depending on the oil and heat you are using. I usually heat up my oven and place the fried ones in there (after allowing the fat to drip off of them for a few minutes) to keep them warm. Once all are done, finish them off with your toppings (we also have salad with them to ease the grease and fat) and enjoy! These are best served freshly cooked, however, they aren’t too bad the next day if you heat them in the oven. 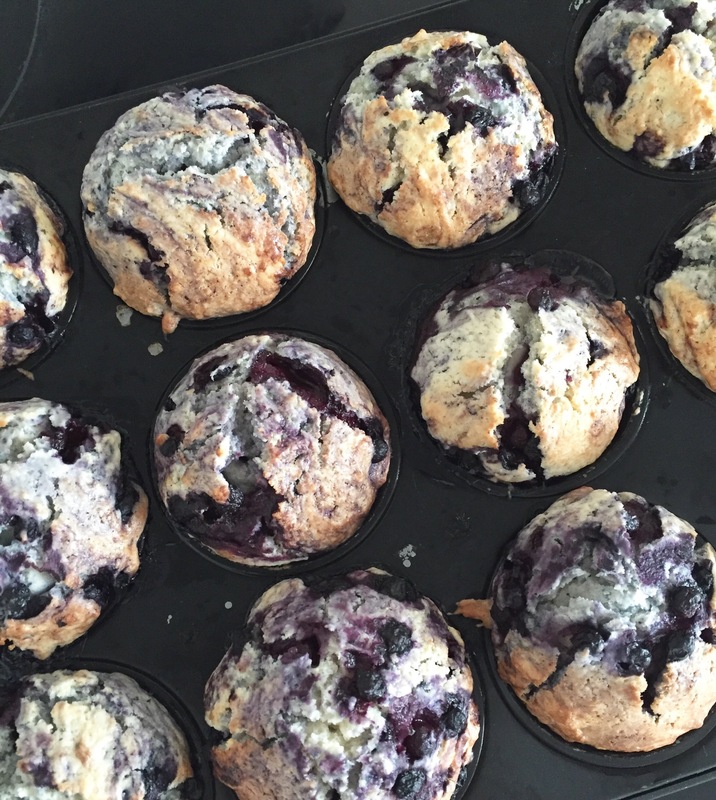 Although this recipe is super simple, it is amazingly delicious!! My husband asks for it a few times a month, and if you have made authentic butter chicken, you know how time consuming it can be. This recipe is a savior, delicious, full or flavor and can be made in under one hour! Mix all ingredients (other than chicken) in with the Greek yogurt. Add chicken. If you are planning to cook it later, you can seal it and store it in the refrigerator for up to 6 hours, of course the longer you leave it the more flavor it will have. You can also start cooking it right away, however, seal it and put it in the refrigerator while you prepare the next steps. In a frying pan, sautee the onions with butter (ghee if you have it) on medium. Once the onions are translucent, add the chicken and marinade. Let the marinade boil down, it will turn into more of a paste after about 15 minutes. Mix the tomato paste in with the tomato sauce and add it to the frying pan. After 10 minutes, add the coconut milk (or cream) and let it simmer for about 30 minutes, or until it has reached your desired consistency. Serve it with this delicious naan bread or basmati rice, it is sure to be a hit in your house! This recipes is one of my favorites for an easy naan bread that goes with everything. It takes about 30 minutes to make and can accompany just about anything!! Mix the flour and baking soda. In a separate bowl, mix the Greek yogurt with the olive oil. Add the Greek yogurt mixture into the flour mixture and mix until the dough starts to form. 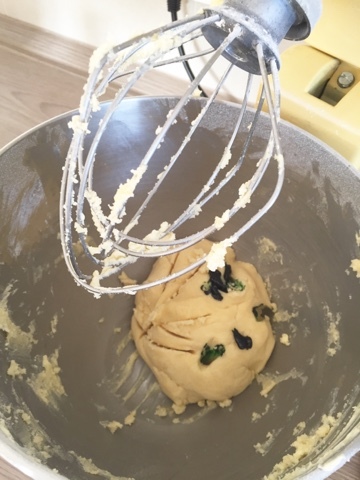 You will need to add the water bit by bit until the dough comes together but isn’t too sticky. Once the dough is formed, roll it out on some flour into a log shape. Cut the log into 8 pieces. Turn your stove on high with a pan that has a lid. Let the pan heat up while you do the next step. 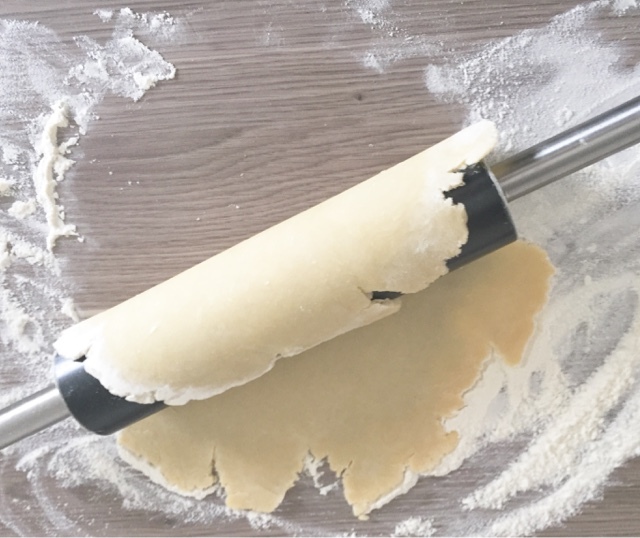 Gently roll out the balls of dough using a rolling pin, I only roll once or twice and then use my hands to make them bigger. 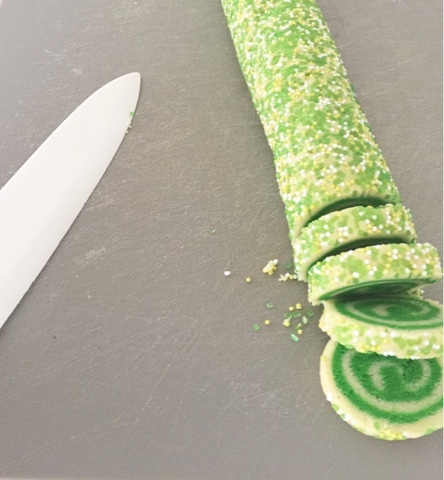 You don’t want to push too hard with the rolling pin. Take your rolled our dough and place it in the already heated pan. Place the lid on the pan as soon as you have put the piece in and continue rolling our your next ball. after about 3 minutes (depending on how hot your pan is) flip it over and place the lid on. Continue this step until you have cooked all 8 pieces! You may have to turn your stove down if your pan gets too hot, be sure to judge by the colour the dough is turning. Usually it appears just as the fire oven cooked naan with darker circles on it. Serve it warm and enjoy! I thought I would start off the first recipe of the year with something healthy (for those of you trying to eat healthier in the New Year!) For those of you who aren’t this is still a winner salad that is super easy and is loved by all who have had it. Right now I am still eating healthy (and give in to pregnancy cravings when needed) but I plan on eating extremely clean once the baby is born. Out of all of my ‘clean’ recipes, this one is for sure a winner, I have it all the time! This is my favorite lunch, especially during the summer. It is so simple, yet refreshing and really fills you up (thanks to the chickpeas). If you have an event where you have to bring something, trust me, this is always a winner! I also use fresh dill and lemon zest from time to time to kick it up a notch! Add it all together in a bowl, drizzle the olive oil on top, season with salt and pepper if desired. I told you it was easy! I usually make this with naan bread (recipe coming soon), they go wonderfully together. Apple pie is one of my favorite things. 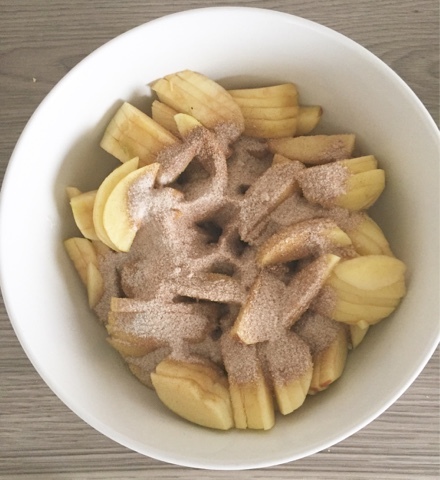 Nothing tastes more like home than apple pie. This is a recipe I use every holiday and it never fails to impress. 8-9 apples depending on how large they are thinly sliced. 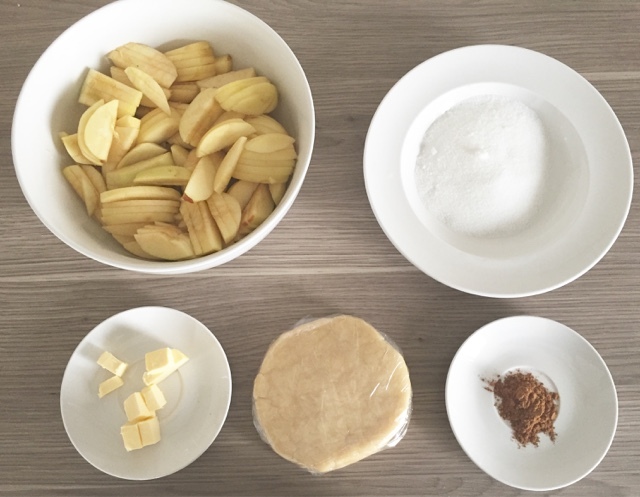 Before you get started, be sure that your dough is rolled out and is placed in your pie pan ready for the apples. Add it to the apples and mix it well. 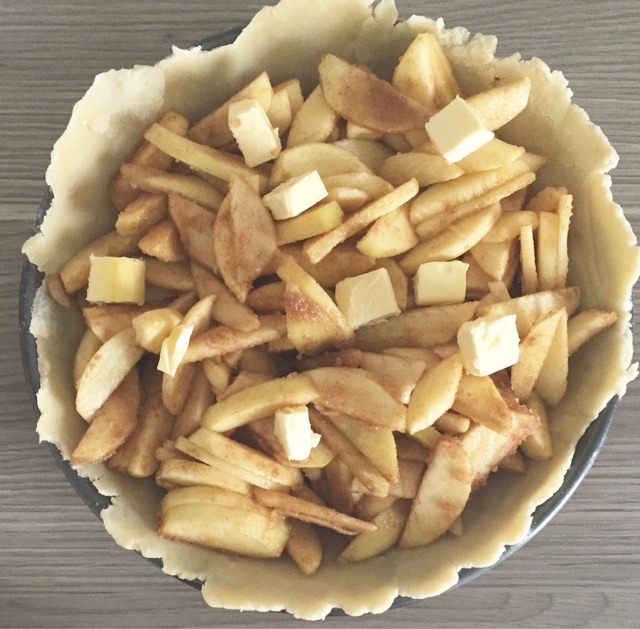 Put the apples into your pie pan and add the cubes of butter on top. 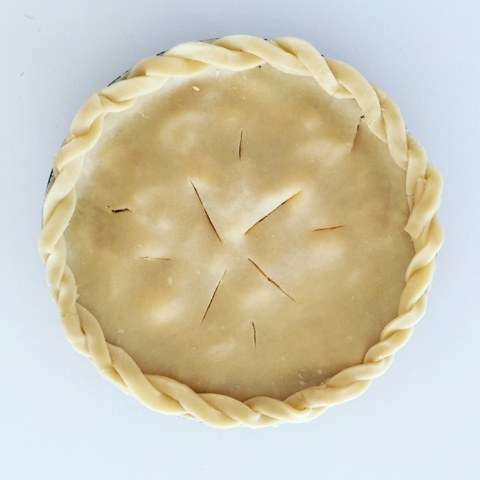 Add your top crust and be sure to make holes in the crust for air and moisture. 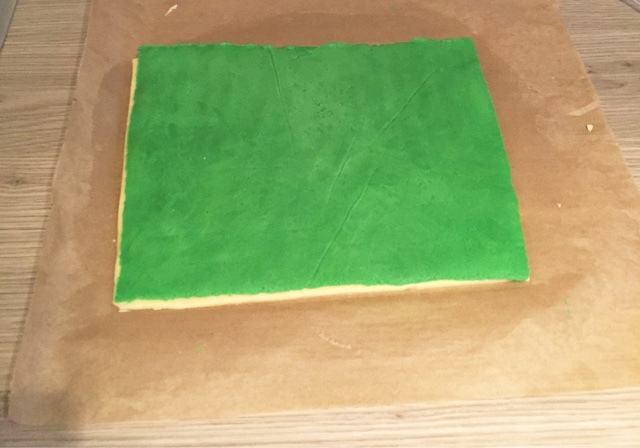 Seal the edges using your fingers or a fork, or if you’re feeling fancy use some left over dough to make it have a pretty edging. Bake at 160 degrees celcius for 40 minutes or until the crust has turned golden. I normally bake this a day in advance and put it in the over shortly before we are ready to eat it so it is warm. Since we don’t eat red meat, most of our recipes contain chicken. I try to get innovative with chicken, but it can be difficult without using too many processed foods. 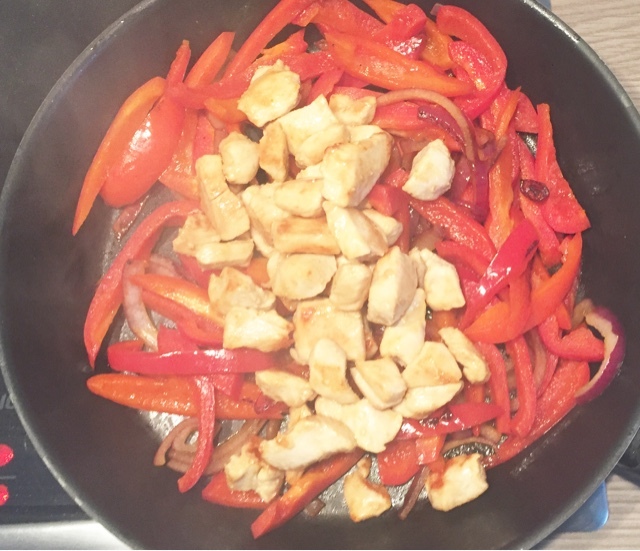 One of our favorite dishes is this simple chicken fajita recipe that request a handful of fresh products and some spices, I’m sure it will be a hit in your house too! First, add the oil to one frying pan and cook the chicken. In a separate pan, cook the peppers and onions. 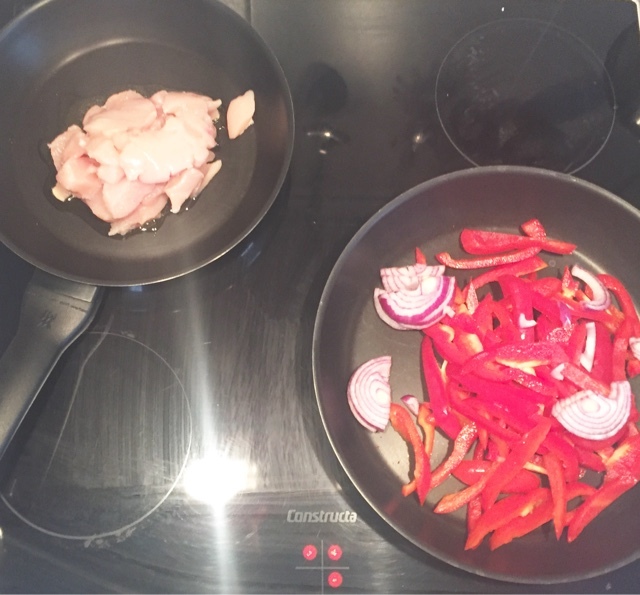 Once the chicken is cooked through, add it to the peppers and onions. Add the seasoning and if you find it is hard to mix, add 1/2 cup of water to mix the seasoning throughout. 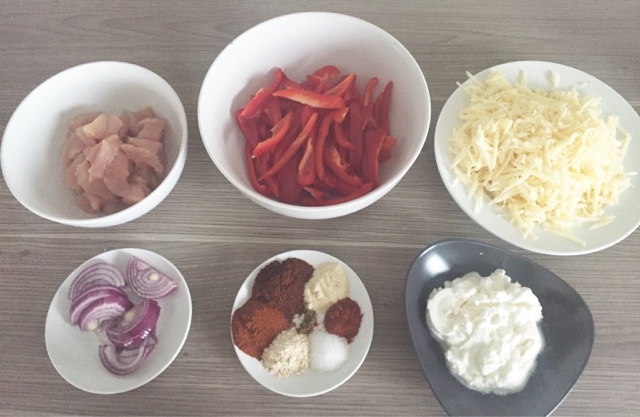 Once the seasoning is fully mixed, serve it with the sour cream, cheese and fajitas and let your guests dish up! I LOVE pie. It is my favorite thing in the world. Unfortunately, all store bought pies contain traces of nuts, which I can’t risk. 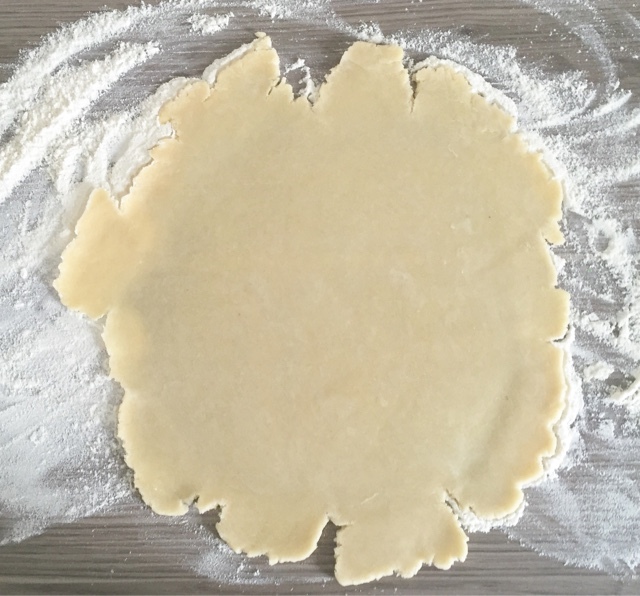 So over the years, I have developed a foolproof pie dough which can be made in a whip. This can be used for savory or sweet dishes. 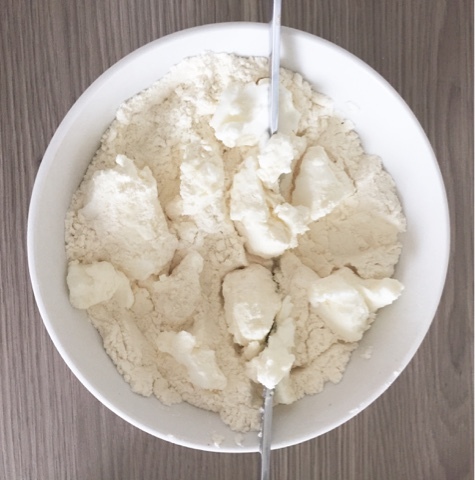 Add the shortening to the flour using either a pastry cutter or two butter knives. Gather the dough and divide into two pieces. At this point you can either freeze it in separate balls or roll it out and freeze it in disks. If you are opting to use it right away, store it in the refrigerator for 30 minutes (in disk shape) before rolling it out. When you are ready to use the dough, roll it out on a floured surface. 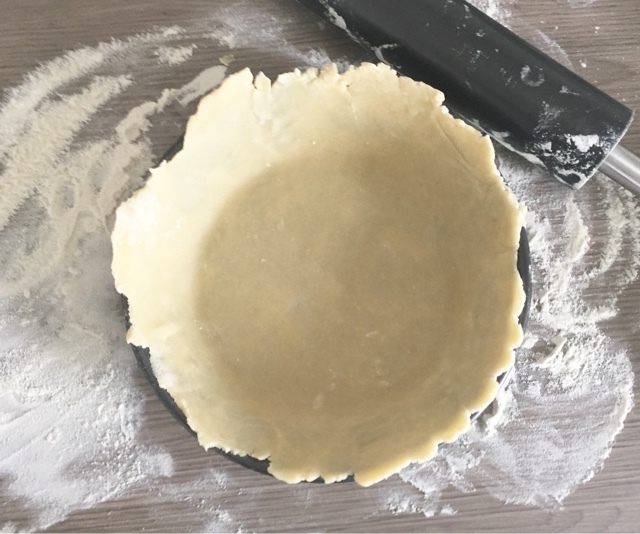 Once it is rolled to the right size for your pie pan, gently pick it up using your rolling pin to avoid any breaking or putting your fingers through it -totally have done! Lay it in the pie pan and, if need be, use your fingers to fit it and make sure there is no air between the dough and the pan. Add your desired filling and bake it according to the filling. If you are using the second half as a top, be sure to roll it out about the same width and seal the edges using a fork or your fingers. What I love most about this dough is it doesn’t require any vodka or vinegar. 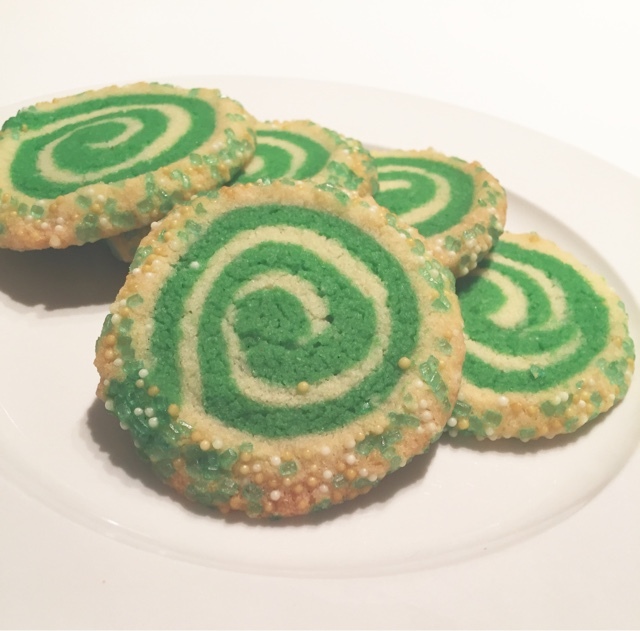 These are one of my favorite cookies to make at this time of year. The good thing is that using different colours, you can also make this for any holiday! I have yet to have a guest not ask me for the recipe. 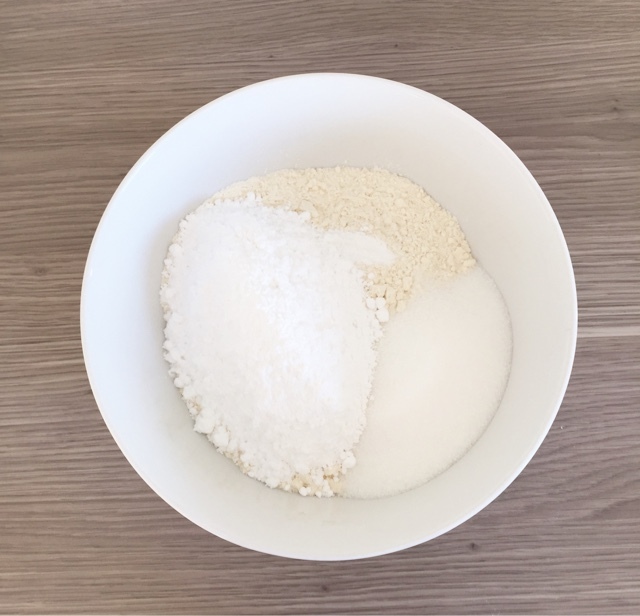 First, combine 2 cups of the flour, sugar, powdered sugar, salt, and baking soda in a bowl and whisk together. 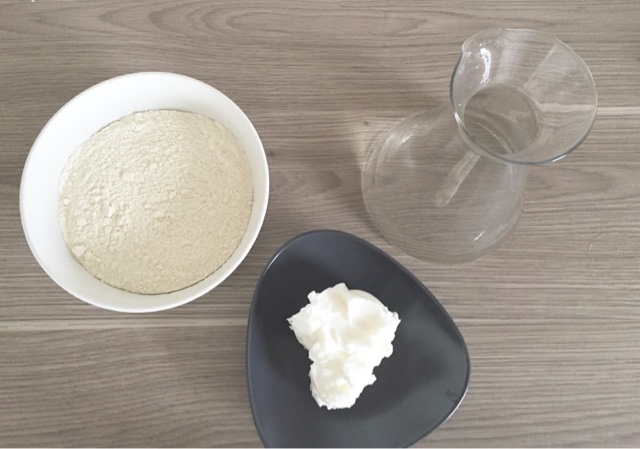 Whip butter with a mixture and add vanilla once whipped. In thirds add the dry mix to the butter and mix until well blended. 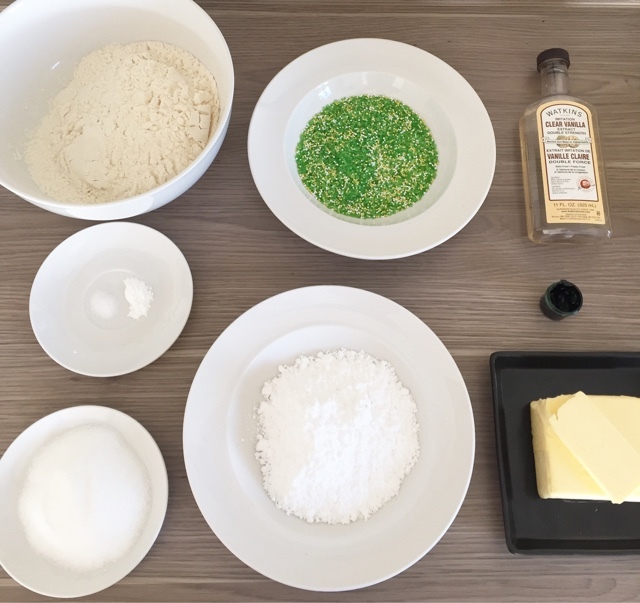 Once all the dry mix and butter are fully blended, divide the dough into two halves (can also divide it into 3 or 4 pieces depending on how many colours you want to use. Put the dough you want coloured into the mixer (in my case it was half). 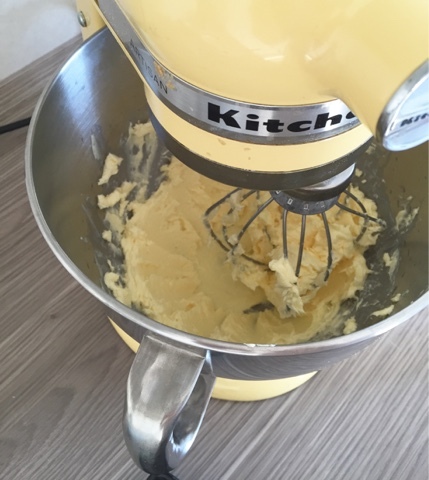 Add desired amount of food colouring to the butter. 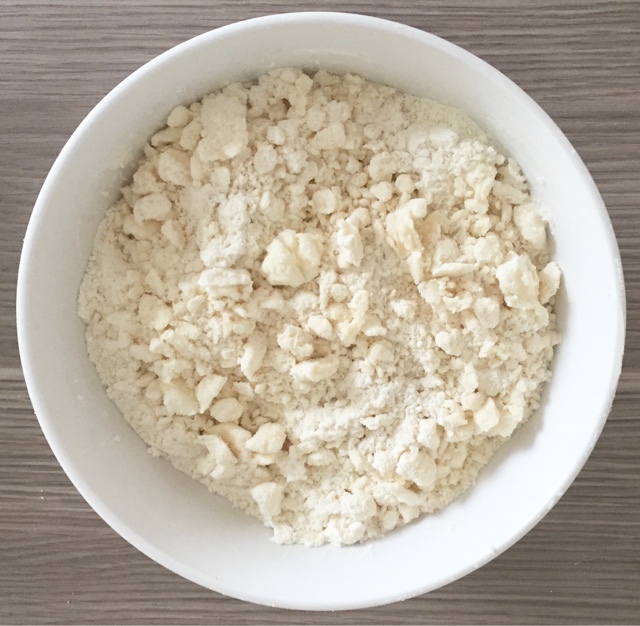 If you are using gel or liquid, add some of the remaining 1/3 cup of flour to get desired consistency. I find with the gel food colouring I use, it gets very sticky and I need to use the whole 1/3 cup. Depending on how soft the dough is (how warm the butter has gotten) you may need to chill the dough slightly (10 minutes or so). It is a stickier dough but it is much easier to work with when it is warm as opposed to cold. Generally I don’t chill it at all. 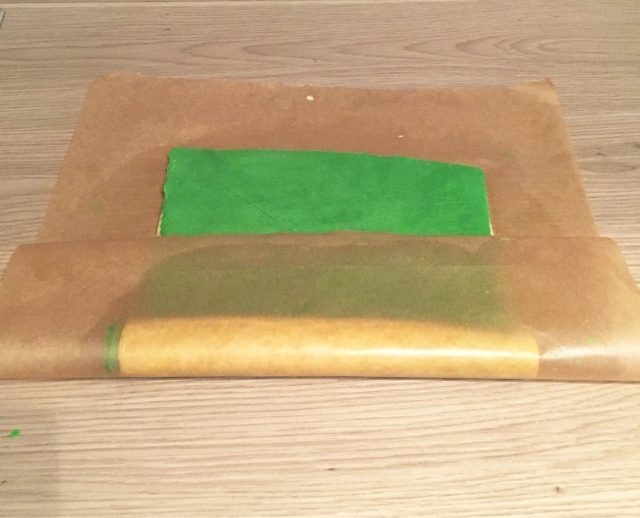 Once you have a good working warmth put the dough between two pieces of parchment paper and roll out dough about 1/2 inch (if you are doing more than 2 colours, roll it out thinner). 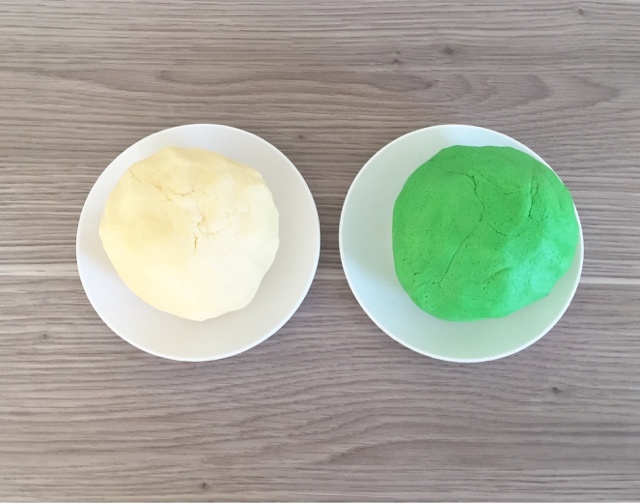 After rolling out all coloured dough, flip the coloured dough on top of the white dough, still using the parchment paper -repeat with all colours if making more than 2 (it is really important to leave one of the parchment papers on the bottom dough for the next step). Cut off any odd ends to make the two (or more) colours the same size. 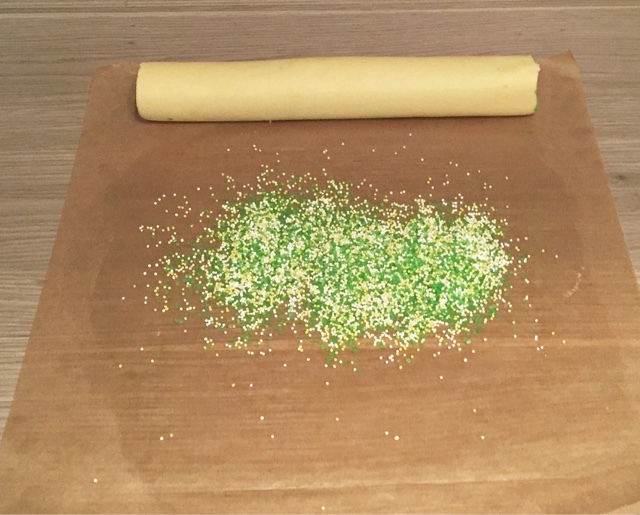 Using the parchment paper, roll the dough tightly like a sushi roll. 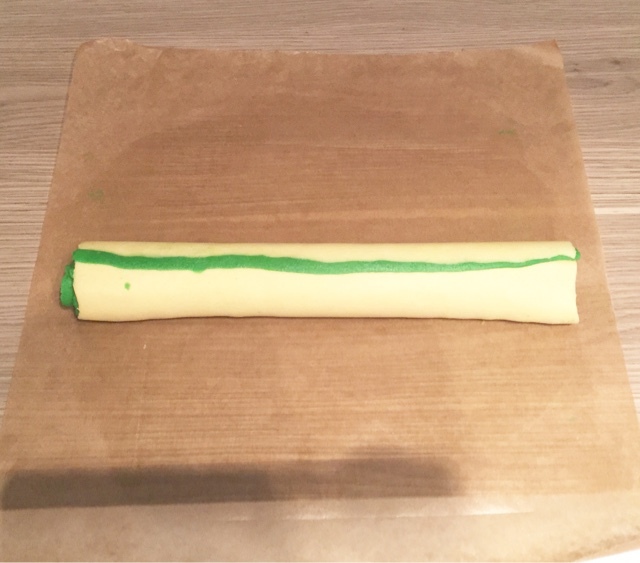 Be sure to pull the parchment paper along as you roll it, don’t let it get rolled up in the dough. Once it’s done, roll it around a few more times to get out any air. 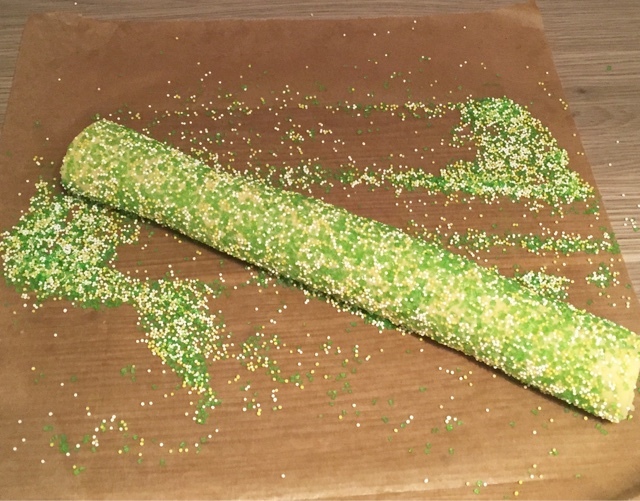 Put sprinkles on the parchment paper and roll the dough around covering the dough completely. 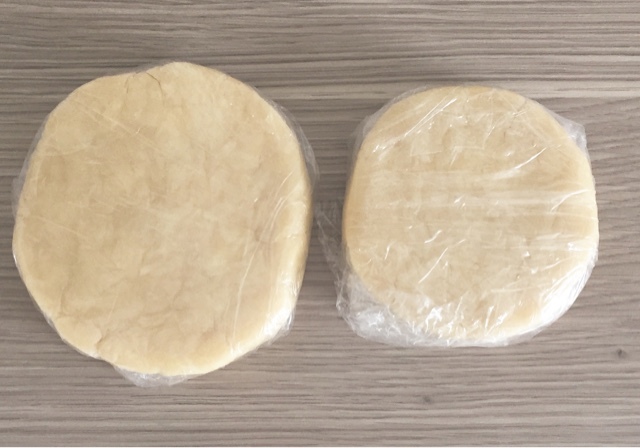 If you are planning on freezing the dough you can roll it in seran wrap tightly and freeze it for up to 6 months. Cut the dough in 1/2 inch slices and separate them on the baking sheet about 2 inches apart. If you feel like your dough is too soft, chill it for 15 minutes in the refrigerator before putting them in the oven. Let me know what you guys think if you make it!